Flour Capacity (Kilogram): From 15 Kg. to 90 Kg. 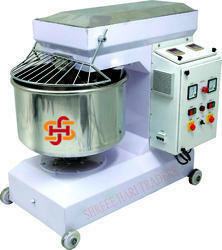 Spiral Mixer is widely used to knead dough for bakery preparations. 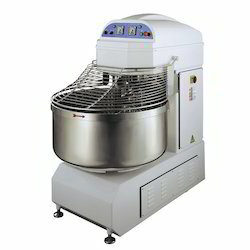 It is very heavy duty and can knead almost all types of dough requirement. It is mainly used at Bakeries. - Full stainless steel twin speed mixer is fitted with bonfiglioli heavy duty life long oil filled gear boxes and independent motors for bowl roation and hook movement. - The mixer can run on different speed and direction. It is suitable for items as khari, bread, speciality breads or rusks. - Special Heavy duty all stainless steel movment system assisted with multiple bearing. We offer Spiral Dough Mixture that helps in mixing the ingredients with high speed and efficiency. These mixtures are hooked on minimum for effective mixing. Further, each part of these mixtures is durably manufactured and is reliable. Easily customized as per the clients' requirements, these mixtures are available at affordable prices.